I love architectural cards and when I saw a video creating a double gatefold card, I knew I needed to try one out. In addition, I also love digital paper collections and seem to buy them but never put them to good use. I had recently purchased the Lavender collection from Nitwit Collections and thought this was the perfect way to accomplish both challenges. 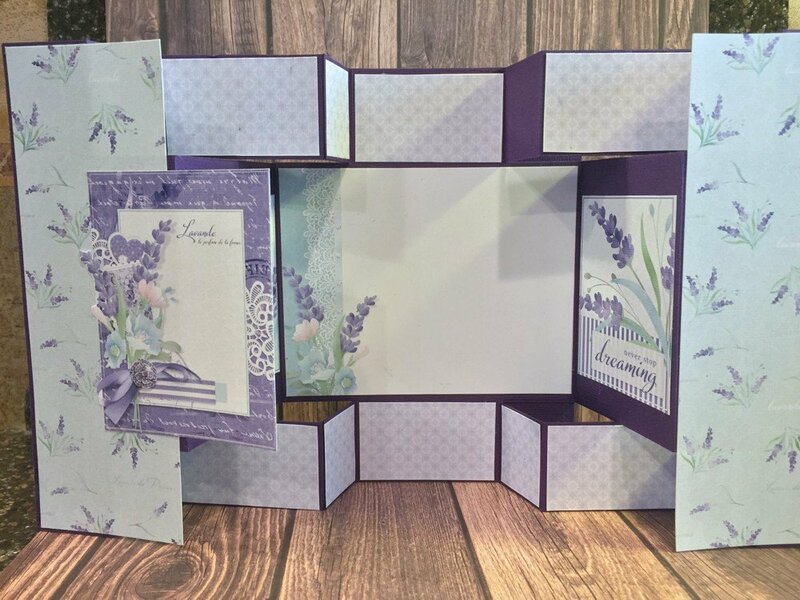 I love the lavenders and greens in this collection and love the theme of lavender (the flower). This collection contains a lot of different patterned papers as well as journaling cards and decorative elements. But first, before I could play with all the pretty papers, I needed to figure out the dimensions for each of the sections. All of the videos I found on YouTube create a 4×6″ card, primarily because you can make two out of a 12×12″ sheet of cardstock. As you may know from reading other blog posts, I prefer 5×7″ cards. So, I set out to convert the dimensions I found online to fit this larger size. Each of the fold lines in the 4 x 6″ card were on 1″ and 2″ breaks for a total of 12″ wide, so it made sense to simply make the same breaks to fit equally across a card 15″ wide. This resulted in breaks at 1.25″ and 2.5″ instead. Because I added an inch of extra height to the card, I was able to stretch the top and bottom bands to 1.5″ instead of 1.25″ as on the 6″ card. But there still was the matter of the extra 3″ of width beyond the size of a 12×12″ sheet of paper. Since my card had breaks at 5″ and 10″, I realized I could use two sheets of letter-sized paper cut to 7″ x 10″ and have a 5″ overlap. As an added bonus, the overlap would give me some extra sturdiness to the back of the card. Projects like this always seem to take twice as long since I prototype everything. In this case, I made an example of the card base using copy paper. This helped ensure my cuts and scores were in the right place before I committed to good paper. It’s not that the purple paper is necessarily expensive, it’s just that I didn’t want to have to run back to the store to buy more if I messed up. The prototype also gave me the final dimensions for the decorative paper pieces. In addition to prototyping the card base, I often will create a digital representation of the final card. This allows me to visualize what it will look like as an end product. Using digital papers makes this really easy to do in Silhouette Studio. Look for a future blog post where I discuss how I do that. You’ll notice this card didn’t include a greeting. Its design can be used for many purposes and I made this one without an intended destination. 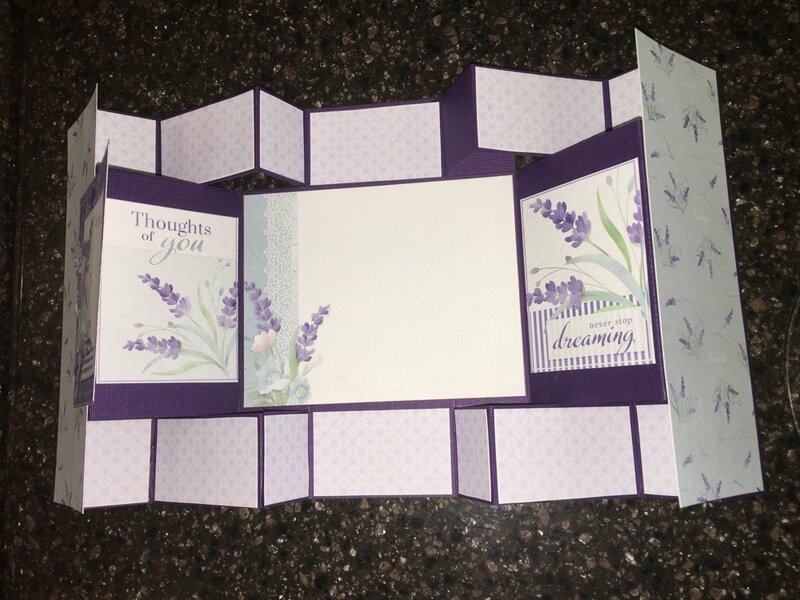 The front could accommodate a small stamped greeting and the inside center panel provides even more space to share your thoughts or add a stamped greeting. 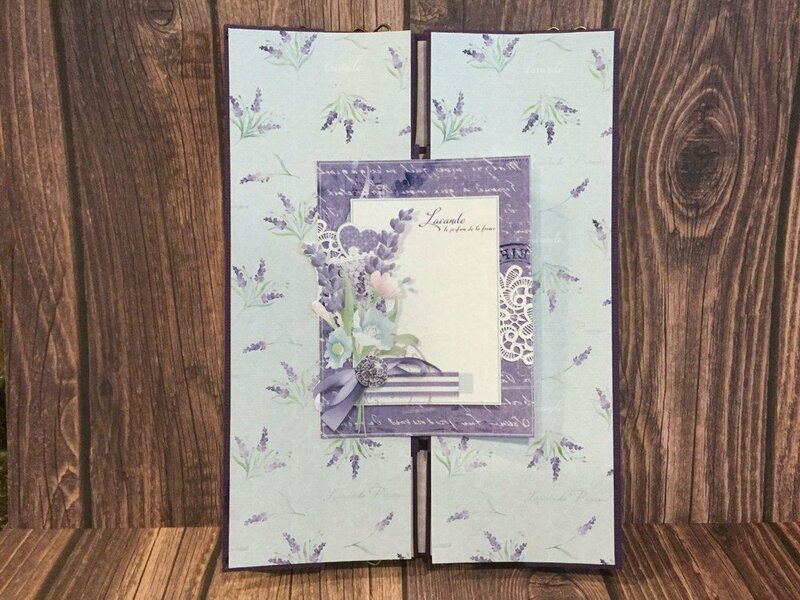 In addition, in place of the pre-printed journaling cards on either side, you could use paper that would allow for stamped greetings there as well. I purposefully left decorative elements off the front of the card since it’s already pretty thick. I didn’t want to incur an extra thickness charge by the post office, it’s already going to require a 2 oz stamp. However, the wonderful thing about digital papers is that you can add as many visual elements to the pieces you create without adding bulk. The front panel I chose came with several elements clustered together, providing visual interest. If this card were to be hand delivered, I have some lovely purple pearl dots that I’d place on the four corners and perhaps a ribbon to hold the whole thing shut. The other great thing about upsizing the card to 5×7″ is that the internal side panels fit 2×3″ journaling cards commonly found in paper collections. Using a 2×3″ journaling card will give you a little excess reveal on each side. However, since this is a digital paper, I simply upsized the journaling card to fit the width with a 1/16″ reveal, further filling some of the vertical gap. This is not an affiliate link, it is merely provided as a convenience to find products used in this project.